An app for anyone who needs a break from all that doing and to enjoy just being for a little while. Explore our amazing tools that can help you relax, re-energise - and be ready for life's next adventure in a matter of minutes. 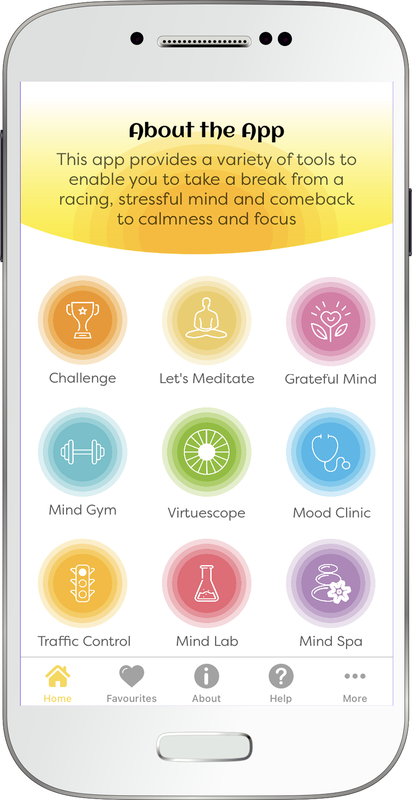 Use Bee.Zone – Tools to enable you to take a break from a racing, stressful mind and come back to calmness and focus. A fresh challenge each day to inculcate a virtue into your daily life. Spin the Virtue Wheel and Meditate on your personal virtue of the day. Select your mood and allow our guided meditations to help shift that mood. Here we have some focusing or relaxation exercises to keep the mind fit and healthy. Try one of our meditation techniques to help you relax and refocus. A variety of meditation audios to relax and unwind. Create moments throughout the day to pause the traffic of your thoughts and refocus the mind. Brahma Kumaris is a worldwide spiritual movement dedicated to personal transformation and world renewal. Founded in India in 1937, Brahma Kumaris has spread to over 110 countries on all continents and has had an extensive impact in many sectors as an international NGO. However, their real commitment is to helping individuals transform their perspective of the world from material to spiritual. It supports the cultivation of a deep collective consciousness of peace and of the individual dignity of each soul. The University offers all its activities free of charge, being funded by voluntary contributions.